Notes: "Washburn & Moen Manufacturing Co., Iron and steel wire. James Rowland & Co. Main granite, Carpenter, Raymond, manufacturers, Cambridge City, Ind., 1776-1876. New Jersey." --Display signs. 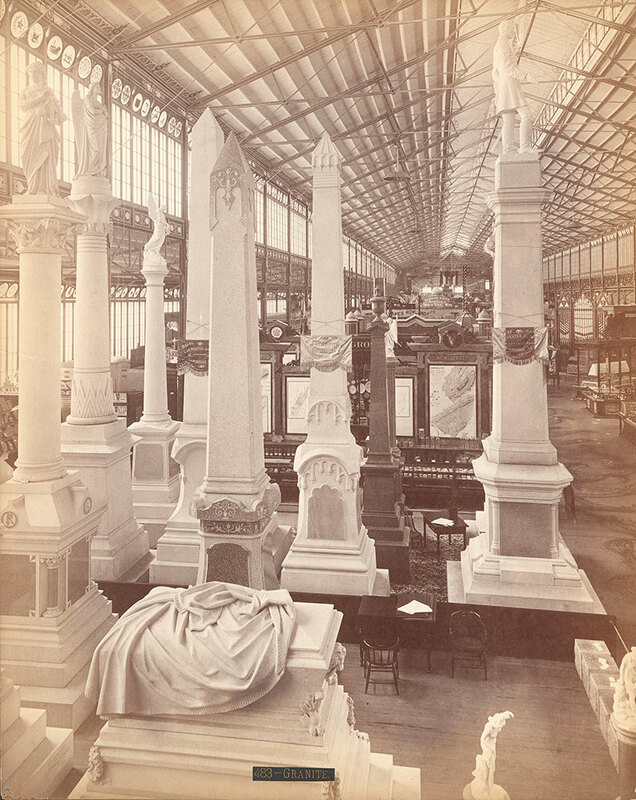 Notes: Display of several monuments of granite and wood, some decorated with company banners. Chairs and tables are among the monuments. Walkway to the left, furniture and other displays (including map of New Jersey) in the background. Notes: Exhibit titles: Carpenter & Raymond, Cambridge City, Ind., Exhibit #190; Rowland, James, & Co., Kensington Iron & Steel Works, Philadelphia, Exhibit # 306; Washburn & Moen Manufacturing Co.,Worcester, Mass., Exhibit # 318, Main Building, Bldg. #1. Notes: Title on label: Granite.